For many young students this will be the first time away from home. "Destination Canada" takes total care of its participants. 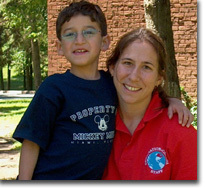 They will be in a friendly and safe environment with 24-hour supervision and health care. Students will be picked up from and returned to the Ottawa Airport. "Destination Canada" will make sure that all return flights are confirmed. Students live in clean and comfortable student residences (two per room). Girls and boys on separate floors. Fresh bed sheets weekly. Full night supervision. Washing machines and colour television are located on each floor. Three meals daily (all you can eat), seven days a week. A large variety of warm and cold food, salads, fruits and drinks. 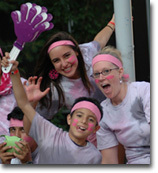 Twenty-five hours of formal English instruction weekly combined with lots of cultural activities and fun. Formal instruction in the mornings. Afternoons are more relaxed with language activities, presentations and games. Evenings are fully supervised by activity and sports instructors. The time is filled with fun and friendship. Language instructors as well as activity instructors are university graduates with appropriate degrees. Classes are limited to 15 students. 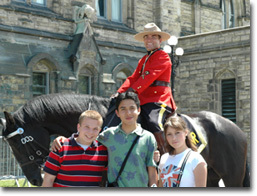 All weekend tours are included: City Tour, Museum, Parliament Buildings, Upper Canada Village, Montreal. The 4-week course also includes a trip to Omega Park (Canadian wildlife in their natural habitat). 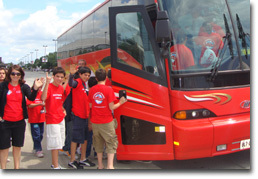 The special tour to the Niagara Falls, Canada's Wonderland and visit to the CN-Tower and SkyDome enhance the "Total Learning Experience" in Canada. There is an additional charge for this tour. All activities are fully supervised by experienced staff. All prices are listed in US Dollars. All taxes are included. Flights to and from Ottawa are not included. Please contact us for details of accomanied group flight.